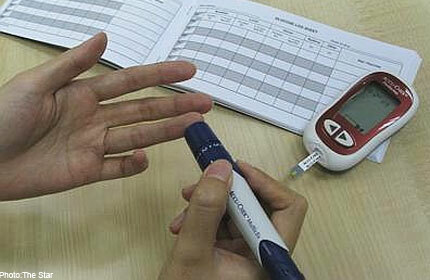 More than two million Malaysians are unaware that they are diabetic, said Deputy Health Minister Rosnah Abdul Rashid Shirlin. This is because they have not had regular medical check-ups. “A study has revealed that more than two million people who have high glucose levels in their blood are unaware that they have a problem. “What is shocking is that these people have not gone for their regular medical check-ups to know of their latest health status,” she said at the opening of the Diabetes Awareness Campaign at SK Kuala Perai in Bagan Dalam near here yesterday. She said diabetes was a “silent disease” and patients would usually only come to know of their condition seven to 10 years later. The event was jointly organised by the Diabetes Council of Malaysia and drinking water manufacturer ECPI. More than 30 senior citizens in Bagan Dalam received spectacles while students with excellent results in the UPSR, PMR and SPM examinations received cash rewards and bicycles at the function. Rosnah said that in 2006, 1.5 million people were diagnosed as diabetic but in 2011, the figure had increased to three million people. “The number will continue to rise if the people fail to change their eating habits and lifestyles,” she added. She advised Malaysians to reduce their sugar consumption and to exercise regularly to stay healthy.